Google Nexus 10 : The Next Evolution ? 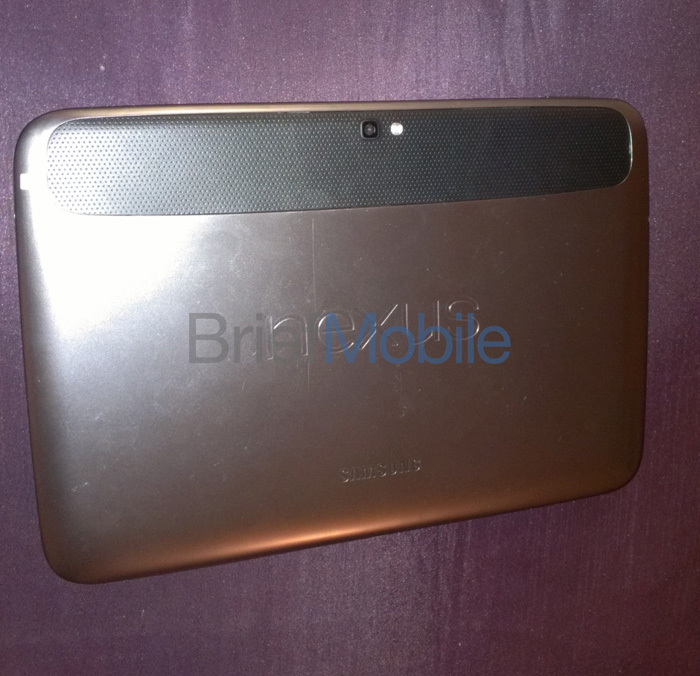 Google Nexus 10: The Next Evolution? The much looked forward to Google Android Event was supposed to happen on 29th October. However, it has been cancelled due to Hurricane Sandy. Further details about the program haven’t been announced yet. We, at Techetron, are hoping that everyone in the east coast stays safe! In the same way that rumors about Apple’s devices were confirmed even before Apple held its event, we knew about a few of Google’s hardware too. 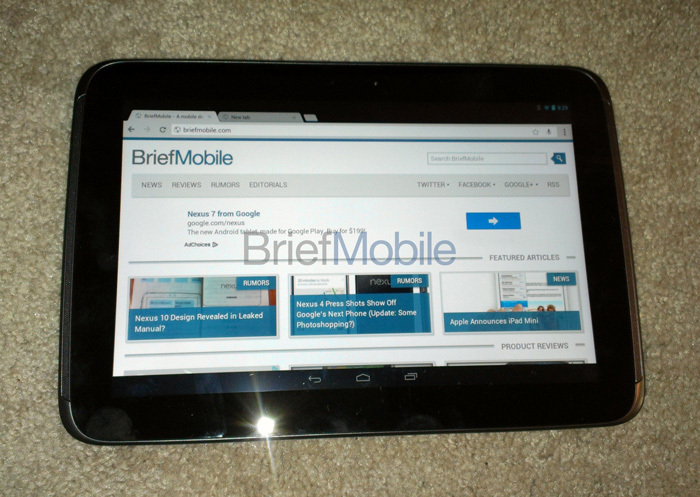 Namely, the LG Nexus 4 and a 32GB version of the Nexus 7 and of course the Nexus 10..
Friends at BriefMobile.com released a short video, only 5 seconds long which shows the Nexus 10 tablet being unlocked and the Google Chrome browser being selected. Even from such a short video and the leaked pictures, the design of the tablet doesn’t look very attractive. Very likely such a design is a result of the great fiasco between Samsung and Apple about the infamous rounded rectangle designs. According to BriefMobile, the back of the tablet feels like brushed aluminium and looks great as its made from a polycarbonate substance. Even though the device looks somewhat thick from above, its apparently very thin and weighs light. The picture below shows the comparison between the Nexus 10 and the Acer A100 Tablet, the former being a much thinner device. It might not be the most attractive tablet but beauty is only skin deep – true beauty lies within. The Nexus 10 is powered by a Dual Core Samsung Exynos 5250 processor clocked at 1.7GHz, a 2GB RAM, which will allow us to really push the device to its limit. It has a 10.1 inch display with 2560 x 1600 in resolutions at 298.9 pixels per inch (PPI), the highest PPI so far in the tablet market, a 5 MP rear-camera and will most likely run the latest Android OS, version 4.2, which is still being called Jellybean – Key Lime Pie still just out of sight for now. How about the price of Nexus 10? Still unknown actually. If its around $350, which is a possibility given the price of the Nexus 7, it would be an arrow straight to Apple’s core. Armed with the latest Android OS, a processor that benchmarks better than Snapdragon, highest PPI to date on any tablet and many more great features, it’s hard to ignore this device when compared with Apple’s iPads. Google has to keep prices low if they want to overthrow Apple. These recent developments in the tablet industry is a big step towards proper choice for consumers. With so many tablets out on the market and great operating systems to choose from, users will not be limited to just one particular product for the best experience. iOS was the biggest one before, but Android has catched up – no longer do they have a bloated and slow OS – Jelly Bean has come a long way, and of course Microsoft’s Unifying Windows 8 landed with quite the bang – literally, for those who watched the Launch event. We only have to wait and see what other awesome gadgets are in store for us. I can’t wait for the new evolution of Google Nexus. Hoping that they will announce the exact date of the release of their new tablet. I think it is a qualified tablet and I am sure Google will price it very competitively. The camera is not very important. There is digital cameras for photo taking purposes. 2GB ram is a good choice by the company. This wouldn’t be the first time Google and Samsung have partnered up, either. The search giant already co-brands Samsung’s Galaxy Nexus phone. But working together on a tablet could certainly strengthen that relationship while creating some serious competition for Apple. The main intention of Samsung teaming up with Google is, as you mentioned, to create a stiff competition with Apple. Just can’t wait to see all the final products to be released in the event. Too bad to hear about the vent being cancelled but anything this good is worth waiting for. I’m very happy to see it has a 5mp camera! These tablets need to start being a little better in the camera area in my opinion. Hope Google announces the new date soon ! Seems like Google has updated their play store with the products that will be announced in the upcoming event.